British colonial values appear to facilitate the entry of Omani women in the historical discourses after spending a painful phase of ill-imposed exile that atrocities to designate them as historical and cultural outcasts. The apprehensions of a recent survey taps the contemporary scenario of Omani women with immaculate precision conveying that almost 17% of the entire Omani workforce has been served by women as the global attention has been focused on them as a efficient key to eradicate the audacities advocated by the didactic mocking of human rights essences. Furthermore, the women participants appear to amaze the officials deployed to ensure national security with their agility of comprehension and multitasking competencies. In this advent, the upcoming research suite is supposed to explore the possibilities of factors that might enhance the participation of Omani women in security services and the military units against the legislative ease they might require backed by the evaluation of the potential hindrances, which is vulnerable for them to face in the course of the process. The legend regarding the participation of women in the wars appears to be saturated with passivity since they are only allowed to nurse the injured soldiers while sparing an empathetic company with the soldiers. These false interpretations of this practice have facilitated the birth of the trend, which intends to judge the functionality of women against their inherent gestural meekness. The flagrant aftermath of this mindset has been inherited across the generation as a tradition to demoralize women simply by undermining their attempts and disabling them to enter into the mainstream discourse. Owing to that perspective, the regression regarding the active participation of women in first hand combat to cater the causes of national securities still pertains valence among a major section of mass (typically male dominated) despite the correspondence of the history embedded with the evidences of various vigorous roles of women in armies (Ladewig, 2017). Furthermore, the spontaneity of endorsing the aforementioned apprehension seems to be justified in the discourses where the narrator intends to hide the emerging insecurity within them while sanctifying their degrading remarks by proposing job profiles that according to the authoritative acumen are suitable to avail for the women with inherent attributes of softness. Apart from the vain dimension of digression from the contextual enquiry, what the previous discussion reveals might inspire the women to transcend from their complacence, which is nothing but a self-enforced exhibition of docility and submission on those quasi-oppressive remarks while ensuring ownself about the petty privileges that the women have been promised in exchange (Tripathi and Al Shahri, 2016). Omani history and the resonating ashes of legends has maintained a consistent tradition of designating women as outcasts of their cultural, historical and even everyday paradigms. After the scattering of the Omanis fueled by the British colonial principles and the subsequent recognitions commissioned by the sultanate of Oman enable Women to enter in the mainstream discourse and within immediate quarters, the women have been able to display their efficient in the several quarters of service and ensure the prominence of their contributions. The political history of Oman owes a lot from the event that portrays the accession of His Majesty Sultan Qaboos bin said Al said since he is one of the eminent Sultans who expects the participation of their women to establish a global recognition of Oman. These reforms can be treated as analogous to the ambition he pertains regarding the metamorphoses of Oman to a diversified global economy with stable infrastructure since fundamentally Oman was a single economy with feeble infrastructural amenities, which is crippled by the financial obligations to many countries across the globe (De Bel-Air, 2015). In this regard, the Sultan is considered to initiate a period of Renaissance, borrowing the perspective to encourage global participation of women simply by endowing them with the desire to develop them as the equivalent of their male counterpart. Unimpeded outbursts of educational reforms subjected to women while introducing several legislative assistance literally endow the women of Oman with the ability to avail their gender majority in a society domed with regressive patriarchal prejudices. After few decades of his accession, Sultan, charged with the intention to nationalize their service sector, inaugurate the notion of Omanization which is supposed to provide legislative facilities regarding to the worker class of Oman. This consolidates the prevalent stance of the women a little bit more since Oman has been successfully able to evade the global dependence on the expatriate workforce while proposing potent national substitutes for foreign labor. What is remarkable regarding this reform is the benchmark, which intends to measure the proportion of this autonomy with the number of graduates per year. In this plentitude of educational opportunities which caters the urge of financial intermittency, especially for the Omani women leads the respective country to such scenario where the total workforce of Oman is partially dominated by Oman with their intuitive comprehension and reasonable multitasking capabilities. Omani Women association, the first of that sort in the political paradigm of Oman started availing the requisite legislative reforms ( The Omani Women’s Association acts) while almost 42% women out of the entire women population seem to rock the civil service sectors with a majority of share. Military sections seem to project no exception in this regard. After the significant leap in the discourse of the Sultanate of Oman, the later phase of the regime appear favorable for the Omani women when the prevalent hierarchy of inherent regression has experienced a significant shift in terms of the perspective imparted on the Omani women. This session of massive educational and legislative reforms chiefly subjected towards women happens to consolidate the embedded notion of financial and intellectual intermittence within the women. The inevitability of the consequences has not been able to touch the expected (rather utopic) horizons despite of the increase in the participation of women in the public service sectors. Moreover, despite the massive reforms regarding the gender-blind classification jobs would not be potent enough to justify the vigorous role that Omani women play in the battleground (Bontenbal, 2013). However, the west-infested countries that prefer to think about themselves as the sole savior of humanity happen to trail from the decadent countries like Oman since they are still thinking about their women to deploy them to cater causes of national securities whereas Oman and several other Gulf countries have already posed their women in the battlefront. Thus, the emerging problem that arises in this regard is there still exists certain impediments with potentially restricting women to act accordingly and simultaneously preventing them to acquire the desired status. 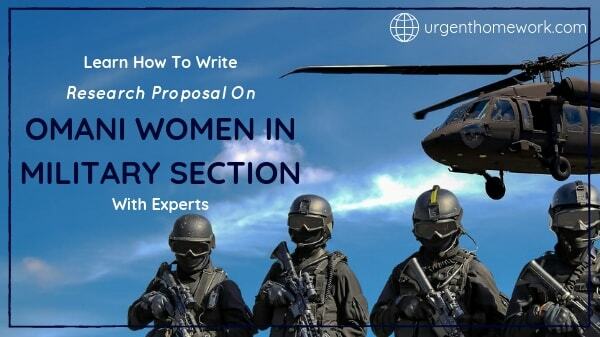 The recurring study is supposed to investigate the potential reasons and their respective inclinations in order to suggest some circumvent remedies that might assist the women of Oman to avail the desired status while facilitating the birth of an instance in the military section to be posed as a concrete evidence of their majority in the respective section as well. What, according to your acumen, is the tool to measure the impact of Omanization on the Omani women? Is the framework of Women in Development can ensure better involvement of the Omani women in the battlefront or army section? What are the governing parameters that have the possibility to encourage Omani women to pursue the careers of their choice? What is the prior hindrances that still restrict the Omani women to participate in the boarder causes like national securities? What are the circumspect recommendations that might enable the Omani women with the acumen to mitigate the hindrances? In the late seventies of the previous century (which is also the advent of the notion of Omanization), several African farmers happen to realize the fact, instead of only being impartial in terms of gender, the blindness regarding the same issue enables the underlying society to be an exploitative threat regarding the physique and psyche of women. The significance of this realization contribute an alternative significance to the recurring study and simultaneously transmit the courtesy to promote the Women In Development (WID) approach which, in its incipient phase, can be conveyed an attempt to endow the women with the requisite legislative amenities that might ensure equal access and control over the resources as compared to the men (Amzat et al. 2017). This attempt also intends to engage themselves into the eradication of such discriminative ideologies in order to facilitate the women to avail education and employment. In this regard, it is imperative to mention that the potential drawback, which is flagrant in this framework, is the negligent evasion of the moot issue regarding inequality of the job profiles and associated encounters, which, in return, seem to pave the entire discourse towards the exclusion of women subordination. Moreover, the agenda of the respective framework appear incapable to address the moot demands of the so-called oppressed section since the majority of the women perceive financial intermittency as the independence to spend their own money at their own timing which proclivity is also equipotent to instill the complacency that they are expected to demolish (Ali et al. 2017). What is positive about the framework is that it confronts the association of job profiles with the attributes of the worker and is supposed to be advocated by the aspects regarding the gender of the worker (Al Subhi, 2016). The consideration of the approach appear fecund in this context since it intends to emphasize on the very practice which facilitates the allocation of jobs as per the suitability the benchmark of which is prevalently framed upon the gestural nuances. The significance of the recurring study is to enable the approach of Women in Development with the acumen to scrutinize the proposed framework since the respective requires to earn the precision in order to tap and simultaneously transmit prudent apprehensions the moot practical issues that the Women, especially the Women of Oman with the hangover of historical and cultural regression is vulnerable to face. Furthermore, the broad purpose that this recurring study is obliged to serve is to identify the potential hindrances and its characteristic inclinations that might be considered to pose the impediments that inherently restrict women of Oman to accomplish the desired heights of recognition and opportunities. It is also included in the purpose, which intends to convey the encouragement of intellectual compatibility of women which might assist them with the acumen to identify the exploiters as the society is considered to pertain it in each section of this debauch hierarchy. In this regard, a qualitative technique of data collection has been adapted to obtain the requisite primary data of the research questions. On that note, a session of interview suite has been arranged in Muscat, the capital country of Oman. This interview suite is supposed to be performed within two cohorts of respondents. The first cohort is designed to be comprised of 15 respondents nominated from across the hierarchy of the military of sultanate whereas the other cohort is composed of 15 general women opted across the population of Oman. Afterwards, the respondents have been obliged to go through the research questions and their respective opinions have been tracked. After the completion of tracking, the opinions have been processed in order to derive the average cumulative inclination. However, in the meantime, the respondents of the interview suite is promised with obligations that the researcher will not divulge any of the discussed issues nowhere except only the purposes intensive to the current research. This has been done on behalf of the ethical obligation and also to retain a reasonable authenticity of the transmitted data. Most of the lauded discourses regarding the aftermath of gender discrimination and the subsequent actions regarding the emancipation of women tend to epitomize the respective gender identity as oppressed and simultaneously encourages them to be financially intermittent in order to ensure equipotent gender status. It is a sheer misinterpretation to associate gender biasness and the cliché consequences with a correspondence of oppressive regime or subverted analogues of the same (Al Hajri, 2017). History imbibes certain traces of events, which can be served as the justification of the latter statement. For instance, Saddam Hussain, despite imposing an oppressive regime tainted with the indelible bloodsheds of gross violations of human rights penchants, exhibited a sincere interest regarding the elevation of women as a paramount wealth of the respective country. In the current regard, the researcher considers the dilemma regarding the transmitted data reasonable due to the active surveillance that the Sultanate of Oman maintains while subjecting their troops and other components of the military unit. Furthermore, it is literally impossible to extract the concrete reasons behind the approach of Women in Development not being conducive towards the practical reality of the Omani women that creates the impediments vulnerable to function. This might enable several researchers of identical pursuits to seek for the development of a more prudent framework that might be able to indicate and respond to the vulnerable and paramount enquiries regarding the practical realities of Omani woman. 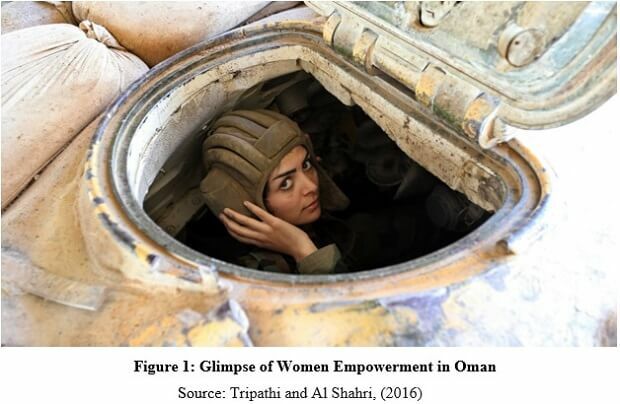 Despite the massive educational and intellectual reforms, that has facilitated the entry of Omani women in the discourse of the mainstream; the typical Arab men still posses certain regressive prejudices regarding the participation of women in the external affairs such as combat in a battleground. As it was deciphered before, this is nothing but flagrant yet cryptic outburst of their insecurity while seeking spontaneous support simply pampering mass sentiments. Moreover, as some of the apprehensions of the prevalent interview sessions underpins their inherent tendency to remain docile to the collective simulations of the respective society. Apart from the above-mentioned reason that the women, in most of the cases, do not own any awareness regarding their self-image in the respective society inherently, provide them with a burden that, in return, refrains them to participate in the boarder causes. From the alternative perspective, the human resources policies appear archaic to embrace the emerging issues with sheer practicality due to the stubborn endorsement on the obsolete human rights penchants. In conclusion, the women require to device the financial as well as intellectual competency, which might assist them to cope with the atrocities subjected towards them while pursuing their desired careers seamlessly. Al Hajri, F.A.H., 2017. Together we are not alone! Raising Omani women’s awareness of the gendered Social Media. Al Subhi, A.K., 2016. Women’s representation in majlis al shura in Oman: How do gender ideology, Islam, and tribalism matter? (Doctoral dissertation, Iowa State University). Ali, Y.Y., Alani, F., Khan, F.R., Badi, A. and Hamood, L., 2017. Employment in the Private Sector in Oman: Sector-Based Approach for Localization. Amzat, I.H., Al-Ani, W.T.K., Ismail, O.H. and Al Omairi, T., 2017. Women’s empowerment and its effect on community development in Oman: predictive model and indicators for best practices. Community, Work & Family, pp.1-19. Bontenbal, M., 2013. Women at work in Oman’s emerging private sector: Opportunities and constraints of female labour participation in a rentier economy in transition. De Bel-Air, F., 2015. Demography, migration, and the labour market in Oman. Ladewig, C., 2017. Power, Epistemology and Pedagogy: Female Teacher Education in Oman. Tripathi, S. and Al Shahri, M., 2016. Omani Community in Digital Age: A Study of Omani Women Using Back Channel Media to Empower Themselves for Frontline Entrepreneurship. World Academy of Science, Engineering and Technology, International Journal of Social, Behavioral, Educational, Economic, Business and Industrial Engineering, 10(6), pp.1929-1934.